Marilyn Monroe My Little Secret, written by Tony Jerris but told in the voice of Jane Lawrence, is the story of the friendship between Jane and Marilyn Monroe. 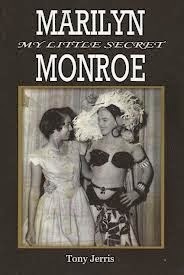 Jane Lawrence was 12 years old when she was became the head of the fan club for Marilyn Monroe. This was the start of a friendship for years to come. This is a well presented and published book that provides a title and cover that intrigues and leads one to wondering what is on the inside. It shouts controversy from the very beginning and is clear by its content that this is what Tony Jerris is hoping to draw, whilst giving Jane a voice. Within Marilyn Monroe My Little Secret Tony Jerris has created a story that places Marilyn Monroe in not only a position of being bisexual but in one that has her making sexual advances toward a minor. As I read I found myself questioning the truth behind a lot of what is claimed, making mental notes to further my research. I questioned the ethics of not only the author but all within the book. It is probably important to note that previous to reading this book I knew very little of Marilyn Monroe. I am one of those who basically has no interest in her personal life or career. This lead me to ‘going in blind’ when reading My Little Secret. I was neutral in my opinion of this woman and her stardom. Tony Jerris has produced a book that is well written and that flows beautifully. Marilyn Monroe My Little Secret is easy to read and pleasant on the mind. Although the topic within can be seen as controversial it is in no way in bad taste, with the reader being left to form their own opinion. With both Marilyn and Jane deceased one can only give Tony Jerris the benefit of the doubt that what he writes is as told to him by Jane herself. To myself Marilyn Monroe My Little Secret was just a book. Nothing it contained totally shocked me to the degree that I felt I could not read on nor did it leave me wanting to rush to the back of the book to find out how it ended. Naturally I knew that Marilyn Monroe died. Toward the end I did feel a little sad for Jane on the death and loss of Marilyn who she saw as not only her best friend but held an immense love for. It was a sudden and harsh closure in the chapter of Jane’s life. I found this book an enjoyable read that I easily read from front to back but one that I did not seek more of when completed. By the time I had got to the end my previous mental notes to research more had been lost as I was ready to tag the book as read and move on to another. I would place this book in the give it a go category. Enjoyable, easy to read and slightly controversial, Marilyn Monroe My Little Secret by Tony Jerris would be suitable for one who likes to read about the life of others or who has followed the journey of Marilyn Monroe on her road to stardom.